The picture above represents a relatively old concept that in no way represents evolution. 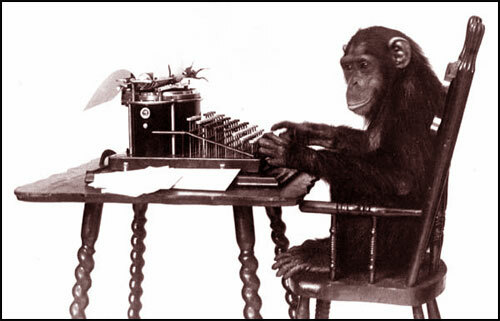 In case you don’t know it, it goes like this: given an infinite amount of time, a monkey randomly plunking away at a typewriter, will eventually write the entire works of Shakespeare from cover to cover. This, in my opinion, is an example of where probability and reality diverge. I have no idea what the odds of this happening is, but I have read that the required time for this to happen probabilistically is much more time than has ever existed. Further, if you consider the fact that every failure of the monkey to achieve the entire works brings the probability back to its original percentage (thinking that more failures means that the success is “due” is known as the gambler’s fallacy), it seems impossible that this unbelievable rare event would ever happen. This is not how evolution works. It seems that many people do not actually understand the basics of evolution – even those who claim that they believe in evolution. I have a very pathetic example of this. I was visiting a friend’s house with a couple other friends. When I entered the house, I saw that the owner’s cat was enormous. I’ve never seen such an obese cat since then. The owner then said, “Yah, I known, and even stranger are his toes!” I looked, and I saw a somewhat grotesque sight. The cat had a serious case of polydactylism – too many toes on each paw. I’ve seen cats with six toes, but this cat had basically two paws on each leg. So, I said, “Ah, I guess that’s why he’s so fat, it must be a little painful to walk,” which I thought was a good guess. But then, another friend chimed in and said, “No, no , no. That’s evolution!” I stood there confused for a moment, trying to think of why this was an example of evolution. Not able to come up with an answer, I asked why it was evolution. “Because he has DNA to be fat, so his DNA developed extra fingers to compensate.” Actually, this friend was pretty dumb, so I doubt he said the word “compensate,” but you get the picture. I recently had discussion with another blogger, DesertWarrior, on his blog post, The Chicken or the Egg, which triggered my desire to write a straightforward explanation of evolution. I feel obliged to explain the basics of evolution so that ignorant believers of evolution and skeptics of evolution alike can at least know what they’re talking about. Note: I will just say “mutation” for any beneficial change in DNA because there are a few ways the DNA can change across generations, but it will be too annoying to reiterate all of them each time. (The main way, by the way, is recombination of the genes in a novel way). Very simply, evolution works by the concept of probability. If you take a game of Texas Hold’em Poker, for example, there are different probabilities for getting different hands preflop (this means, the first two card you get – don’t worry, you don’t need to know all the details of Hold’em if you aren’t familiar with this). The odds of getting the best hand (pocket aces) is 220 to 1, or 0.45%. It is very improbable to get this hand; however, if you play 220 hands, probability says that you should get this hand once. Of course, sometimes you will get this hand 10 times in 220 hands, and sometimes you won’t get this hand in 500 hands. But the average is 220 to 1. Now, apply this same logic to the probability of a specific gene mutating in a way that is beneficial to the organism. Let’s say the chances are the same as pocket aces, 220 to 1. Then, if there are 220 offspring born in one year, this mutation is expected to happen once. Suddenly, something that is improbable, because expected. In this way, there is no luck or chance involved in evolution. Add to this the fact that every part of your body can be modified in a beneficial way by a mutation. This means that each organism is not just taking a gamble once with one particular mutation, but with every single part of their DNA that can mutate. Now, you must realize that most mutations are bad or neutral, so good mutations are not common. However, as we can already see, each organism has many chances to have one good mutation, and these chances are compounded by the number of offspring within the species. As a result, the probability will always be in favor of adaptation. Next, is the concept that determines which mutations will survive. The one fact that confuses most people about evolution is that there is no such thing as a good gene or a good mutation. It’s all relative to the environment. Being a tall person may be beneficial in our current society, and the trend is that humans are getting taller; however, this is only because we enjoy an abundance of food. In an environment lacking food, being smaller is a benefit because you need fewer calories to survive. It all depends on the environment surrounding the organism. Of course, mutations have no consciousness. Unlike as my stupid friend noted above thinks, evolution has no ability to compensate or consider the environment. It is all due to the fact that many probabilities are occurring simultaneously. Some organisms are born with serious deficiencies, and die. These organisms never procreate and never pass on their DNA. Some organisms appear more sexually attractive and they will procreate more and pass on their DNA more successfully. Some organisms will have a better ability to survive, and they too will have a greater ability to pass on their DNA. Over deep time, these beneficial mutations add up in the descendants of a particular organism, and the descendants look very different than their ancestors. This is a slow process. It is not a sudden jump from a fish to a dinosaur – that would be the equivalent of the monkey writing the works of Shakespeare on a typewriter scenario (in a word, impossible). That’s it. That’s the basics. There is no need for a guiding hand in this process. If you think it’s too unlikely to be successful, then you can simply check out the various computer simulations that have been done with these simple parameters. Every time, the computer organisms rather quickly (on an evolutionary scale) adapt to their environment. It works mathematically, and it works in the real world. Now, there are people who will raise questions about specific aspects of evolution (such as speciation, or “why are there homosexuals?”, and so on); but what I have said above is what anyone who wants to talk about evolution MUST know without sounding ignorant.